Judith Curry is going great guns diving into denial territory. Yesterday I wrote about her appalling testimony to the US Senate Committee about the IPCC report and implied it may be preferable to "modify the climate" by continuing to add CO2 rather than reduce it. Today she's writing about an article in Nature by Jeff Tollefson (archived here). JC comment: My, my. Recall David Rose’s article in Oct 2012 on the pause, claiming that global warming had stopped, and the pushback against Rose’s article. The pause has now gone mainstream with this article in Nature, even in the IPCC did its level best to downplay it. David Rose put up a monthly chart going which he said went back to the beginning of 1997 and claimed that global warming stopped sixteen years earlier (why he didn't put up annual temperatures back to and including 1996 is obvious). Even just looking at surface temperatures, no-one in their right mind would claim that the land and ocean surface temperature has not risen since 1996 and they certainly couldn't claim that global warming stopped in 1996. 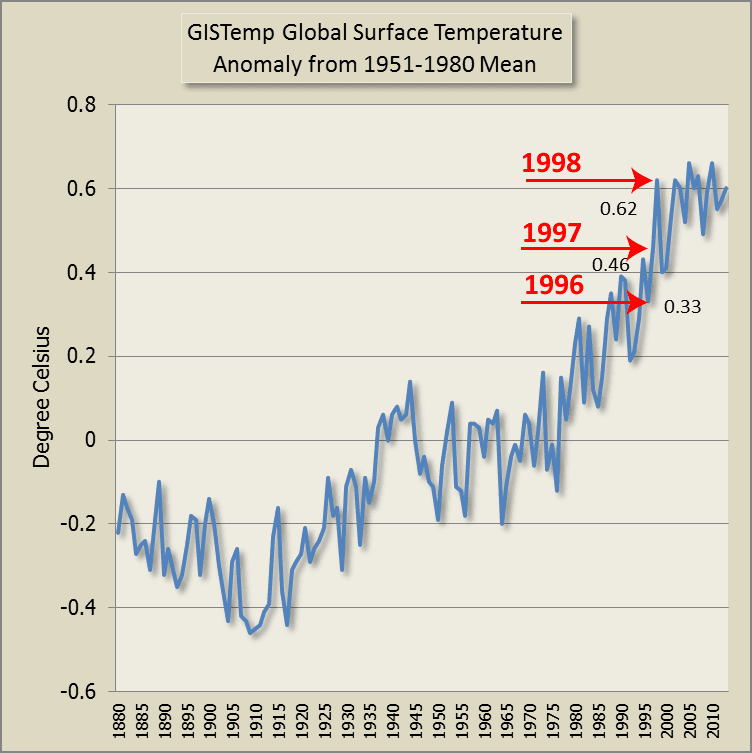 Claiming no warming since 1997 is a big stretch, too. Now, no one understands the cause of the pause, but climate scientists say the heat is hiding in the ocean. My next post will be on ocean heat content, so I’m not getting into this here. The competing explanation (the ‘denier’ one, I guess since I don’t hear mainstream climate scientists mentioning this) is that the heat never made it into the system, possibly related to changing cloud patterns or properties that reflected more solar radiation. ... Size matters here, i.e. the length of the hiatus. Depending on when you start counting, this hiatus has lasted 16 years. Climate model simulations find that the probability of a hiatus as long as 20 years is vanishingly small. If the 20 year threshold is reached for the pause, this will lead inescapably to the conclusion that the climate model sensitivity to CO2 is too large. Further, 20 years is approaching the length of the warming period from 1976-2000 that is the main smoking gun for AGW. Depending on when you start counting, indeed. David Rose's 16 years dated back from August 2012, according to him. Judith is saying "depending on when you start counting". Sixteen years ago doesn't depend on when you start counting. It's obvious that you start counting from now. If you are going to claim that "this hiatus" has lasted 16 years you are saying it started in December 1997, during the super-El Nino. Anyway, here's a chart showing the global surface temperature anomaly. I've marked David Rose's "sixteen years" from the end of 2012 - to the year ended 1996. Judith's "sixteen years" from the end of 2013 to the year ended 1997 and also highlighted 1998 - which will be sixteen years before the end of 2014. Looking at the above, if you were into pattern recognition, you might be tempted to postulate that the "hiatus" could last as long as the one from 1940 to 1970. That is, until the 2030s as Judith suggests (see below). I guess you'd have to rely on only a single cycle of the "pattern". Anyway, if that were to happen, one would probably also postulate that then there'd be another huge rapid rise in surface temperatures and that by 2060, surface temperatures could be another 0.6 degrees or more higher than now - or a rise of 1.4 to 1.8 degrees above temperatures of the early twentieth century. It would be getting mighty hot by the 2060s. Not that I'm suggesting you rely on pattern recognition. I prefer the climate model approach. And how hot it gets will all come down to how much more CO2 we put in the air over the next few years and decades. Rather scary that Nature does not seem to acknowledge that skepticism is one of the norms of science, and regards ‘skeptics’ and ‘scientists’ are mutually exclusive groups. I agree that he should have made it clear what he meant. I presume he meant "fake skeptics" not "skeptics" when he wrote "This has led skeptics – and some scientists " and he should have made that quite clear. People are interested in climate change on all sorts of time scales, including decadal. Especially since climates are changing so quickly now with all the extra greenhouse gases we are adding. Not that we can tell much over only, say ten or twenty years although climates can change quite a lot in fits and starts. So while I agree what people are "interested in", I'd argue that on a decadal time scale it's hard to identify a change in 'climate'. In Australia we have big extremes of climate - going from drought to floods. But these are all features of the same climate. In south-eastern Australia we generally have excessive heat and drought with El Nino and colder weather and floods with La Nina. Climate shifts don't become apparent on a decadal timescale. You need a multi-decadal time scale for that. For example, compare the climate here of the 2000s with the climate of the 1950s and you'll notice quite a difference. Solomon should have stated that if you are interested in the climate response to a long-term secular buildup of greenhouse gases, then your main focus should be timescales of 50-100 years. I agree with this. And if you look at the last 100 years, you have that other inconvenient pause to explain: 1940-1975. With the reduction in sensitivity to aerosol forcing, the aerosol explanation for this earlier pause no longer holds up. Stadium wave dynamics can explain both the 1940-1975 and the current hiatus; a further inference is that warming of 1976-2000 was enhanced by natural climate variability..
...she sounds just like one of those fake sceptics she referred to earlier. A denier. With her use of the term "inconvenient pause". Still, I'm interested in what is the current explanation for the variations in global surface temperature over the twentieth century. I went to the latest IPCC report and found nothing so Judith might have a point. It's as if that period of flat temperatures is considered inconsequential. But then the AR5 IPCC report is very long and it's hard to know what search terms to use. And reading the text looking for a clue makes my eyes glaze over. Anyway, if someone knows of any recent papers on the subject can you let me know. As I recall, most of the mid-century "hiatus" is put down to aerosols and decadal ocean variations (eg the PDO was negative). There wasn't nearly as much CO2 in the air in the middle of last century. And clean air regulations came into effect in most industrialised nations in the late 1960s and early 1970s, so the aerosols diminished a great deal, coincidentally with temperatures, and CO2 emissions, taking off at a great pace. This variation in ocean temperature, known as the Pacific Decadal Oscillation (PDO), may be a crucial piece of the hiatus puzzle. JC comment: I certainly agree that the PDO is probably a crucial piece of the puzzle, but one of the quickest ways to get labeled as a ‘denier’ has been to argue that the PDO in its warm phase contributed to the 1976-2000 warming. For a climate scientist Judith should know better. As a science contrarian she should be more familiar with denier arguments. 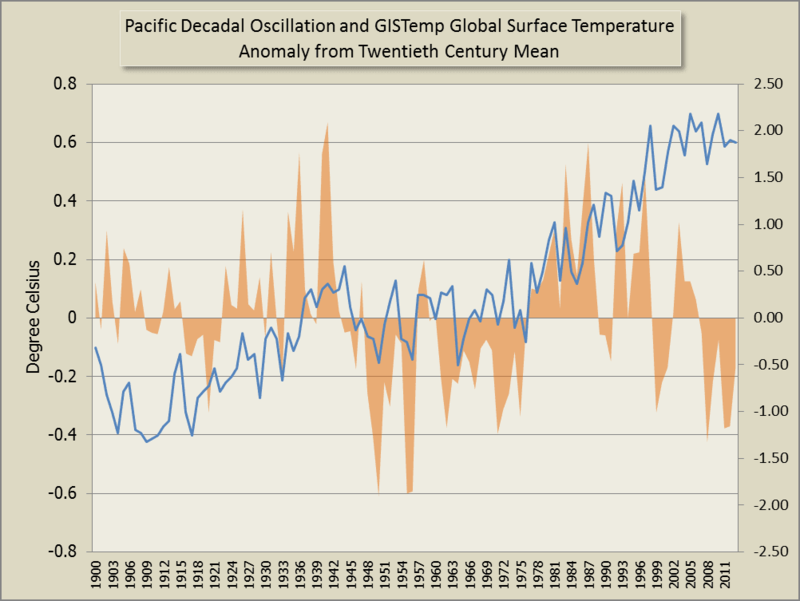 The typical argument is not that the PDO contributed to the warming. It's that it caused the warming. Deniers generally don't accept that the world is warming or, for those that do, they argue it's "all natural" or "mostly natural". I've written an article about a typical denier opinion about the PDO. It's sarcasm rather than science so you'll have to read between the lines. To get around the problem of why surface temperatures are still rising despite a negative PDO, the denier in question argued that there was a lag in the effect of the PDO. Which is nonsense. If there were a lag now, why wasn't there a lag in the past? But the denier's argument had a more fundamental flaw than that. The PDO is "baked in" to the global surface temperature. It's an index of sea surface temperatures in the Pacific north of 20 degrees. So it can't be separated out and treated as if it's an external forcing. It's not. It's a measure of natural variation in the sea surface temperatures. Any change in the PDO is incorporated into global surface temperatures. The fact that Judith isn't familiar with denier memes is somewhat surprising. Most people who congregate at her blog are fake sceptics. Maybe she doesn't read their stuff or maybe they haven't covered that particular meme on her blog. Anyway, if you're reading this, Judith, you'll now know why people get put in the fake sceptic camp when they talk of laggy PDOs causing global warming. “You can’t keep piling up warm water in the western Pacific,” Trenberth says. “At some point, the water will get so high that it just sloshes back.” And when that happens, if scientists are on the right track, the missing heat will reappear and temperatures will spike once again. JC comment: Well that is an interesting ‘forecast.’ If this is natural internal variability, e.g. the stadium wave (which includes the PDO), then you would expect warming to resume at some point (I’ve argued this might be in the 2030′s). This would make the hiatus 30+ years (similar in length to the pevious hiatus from 1940 to 1975). This is long enough to invalidate the utility of the current climate models for projecting future climate change. I don't know what Judith is referring to when she says interesting "forecast" in inverted commas. ENSO is now well accepted in climate science and has been for quite some time. El Nino's release a lot of heat from the oceans up into the atmosphere and raise the surface temperature. For Judith to describe a self-evident statement about the next El Nino as "interesting" is "interesting" itself. We found that the stadium-wave signal propagates through four different stages of climate regime evolution. Each stage reflects a particular behavior or a particular set of subprocess interactions. And at each stage, activity is heightened in a particular geographic region. At all stages, seeds of regime reversal are embedded within the collection of sub-processes regulating the Arctic freshwater balance, thereby subtly and incrementally imposing ‘curbs’ on the prevailing trend of sea ice coverage, assuring an inevitable regime reversal years in the future. In any case, according to Judith, the stadium wave will prevent further warming until the 2030s. If there is significant warming in the next twenty years I expect she, or more probably Marcia Wyatt, will revisit the stadium wave idea and either toss it or refine it. I've wandered around a bit in this article - largely led by Judith's article. It's time for a closing comment. Given Judith's focus on what is not known rather than what is known in science, I got curious about what new knowledge Judith has contributed lately. What I found was that it is remarkably little - at least as lead author. Apart from her uncertainty monster "paper", she has not been lead author of any journal paper for almost eight years. Not since 2006 as far as I can tell from a Google Scholar search or by looking at her list of publications. And that 2006 BAMS paper had the title: "Mixing Politics and Science in Testing the Hypothesis That Greenhouse Warming Is Causing a Global Increase in Hurricane Intensity". Maybe she regards blogging as a better career move than trying to stay in the publications race. Now, I've never heard Josh Willis or the Jet Propulsion Laboratory referred to as "denier". Exactly, JCH. There is any number of papers that point to ENSO and the PDO "contributing to" the ups and downs of global surface temperature. Judith would know that very well. She is twisting the science for her own purposes. Curiously, Wyatt13 doesn't reference too many papers on the Pacific Decadal Oscillation as such, even though it says it's part of the stadium wave. From a quick look, the most general paper on the subject that they've referenced is an older paper from 2000 by Miller and Schneider, which in turn does reference a lot of papers relating to the PDO. They've referenced a couple of others as well. Still, I guess the literature they cited was sufficient for the purpose of the paper or it wouldn't have been published. The PDO is only the North Pacific sea surface temperature index. The IPO or Interdecadal Pacific Oscillation is the more relevant index because it is the Pacific-wide manifestation of sea surface temperatures. From that we can infer the state of the worldwide wind-driven ocean circulation. If you factor in the 93.4% of global warming that is going into the oceans, then the Earth has warmed faster in the last 16 years than it did in the previous 16 years. Do magical stadium waves predict this behaviour? Can't recall if I've noted it here before, but ICYMI Judy started her participation in the blogosphere at about the same time she and husband Peter Webster launched CFAN, a private weather/climate forecasting consultancy. IMO when it became clear to her that she couldn't obtain a high public profile (desirable for promotion of the consultancy) by supporting the consensus, she quickly went the other way. One might think that potential clients wouldn't care for that sort of public posturing, but remember that this is the Deep South we're talking about. Probably it's worked out nicely for her, albeit at the cost of her scientific reputation. Curry: "Rather scary that Nature does not seem to acknowledge that skepticism is one of the norms of science, and regards ‘skeptics’ and ‘scientists’ are mutually exclusive groups." Rather scary that Judy chooses to misrepresent so blatantly what Tollefson wrote. It's normal for people who are department chair to have a drop in publications. They are looking for a replacement, so you may see her activity go up. Yes, I can understand the role includes management, which takes time. But is a drop to only one publication (as lead author) in eight years expected? I'd not have thought so. Contrast with Barry Brook, Chair of Climate Change at Adelaide Uni (since 2007). Here's his list of publications. He also runs a blog and does lots more besides. Well, she also has her side business (smiley) which can be quite demanding I'm sure....please I have no sympathy for her. About 1/3 of the citations for Wyatt12 are either self-citations or citations by cyclomaniacs, most notably Scafetta. Not a great recommendation. But the IPCC are also partially to blame for using hopelessly out-of-date data in AR5. 16 years (OK, 14 years considering when draft revisions of AR5 were first cut) is a long time not to account for, what with all that CO2 we're putting up there. I now 'think' I know what JC is trying to say. The end of the last ‘stadium wave’ occurred in 1975, when warming became evident in the surface temperatures. Therefore, there was an outpouring of energy from the quasi-cyclic hypothesised phenomena at this point in term. The resulting rate in warming (approx. 0.2 degrees/decade) was as a result of AGW and the contribution from the stadium wave. The stadium wave has entered its current cycle accumulating energy from the atmosphere, and therefore resulting in the hiatus. The next phase will occur in 50 years from 1975 (2025-2055) whereby warming will continue, JC predicted in the 2030s, so I would guess that she prophesises an approximate 50 year cycle this time around. Now, given that she anticipates ongoing warming after this period, she does not discount AGW. She is trying to state that the climate sensitivity is considerably lower than the quoted range. Indeed, if her theory was correct and we had no warming until 2030, this would be the case, if you also accepted that this last 80 years was a complete cycle and the hiatus from 1940 was as a result of a stadium wave. However, for her theory to have any credibility she would need to account for the hiatus from 1940-1975. It has already been shown that this was as a result of atmospheric aerosols, which have been shown to have resulted in global dimming and from the empirical evidence from the observed change in day and night time temperatures. However, let’s assume that this did not fully account for all of the hiatus. This also assumes that the degree of AGW forcing in 1940-1975, bringing about the hiatus then, is the same as it is currently, and clearly this is wrong. The cooling of the stadium wave effect to create the hiatus from 1940 (with lower AGW and global dimming from aerosols), would not be expected to result in a current hiatus, but rather a slowing of the warming rate. Maybe the quasi 50-80 cycles absorb different amounts of energy? If this cycle is operating the way I ‘think’ she means, then one would expect during the 1940-1975 hiatus there would have been an increase of ocean heat, and a cooling from 1975. What you actually see is the opposite which would suggest that global dimming was the overriding factor for the 1940-1975 period. In light of the above I guess that JC will be waiting until the 2030s before she publishes her next paper, although the hypothesis will have gone pear-shaped well before then.